It has been a while since Pinky has made the blog. Not sure why because we spend a lot of time together hitting the city in search of good eats. Oh, and we did see The Cure last month which was just the BOMB! Yes, The Rooster is a fan of The Cure. Nuff said. In any case, Pinky and I started to long for a good food day in the city. Since it was my birthday we figured that we would meet up and hit a few spots in search of a good meal to celebrate. So lets go shall we. Of course one had to try regional cuisine while in NYC. Thus, we decided to join John "The General" Lee and E at the Mississippi Fest. Ummm...well it is not NYC regional food but you can taste every region in NYC and we decided to head south. This festival is held every summer and since 1972 or so the governor of the state has showed for the fest! They had Catfish and all the trimmings. But as most things in NYC the festival has caught the vogue crowd. Thus, festival has gotten too big for its britches. They ran out of food and also ice for the sweet tea. Now what kind of festival is that? In any case, it was a good time with good people. The only thing is that it was hot and muggy...just like The Dirty-Dirty so the weather fit the bill. How did we find out about this fest....E, she is Mississippi...yes, she comes with an Southern Bell accent, too! Those of you from the South...the real South...sorry, Texas isn't the South. 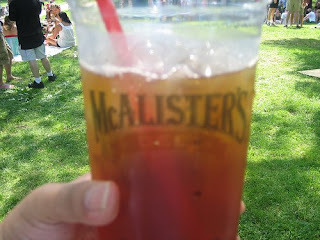 In any case, I guess this is the real deal when it comes to Ice Tea in the South: McAlister's. Make note of it and you heard it here first on this site...holla! After much running around to Central Park to check out Mississippi Fest and such...we decided to try SoHo Park. 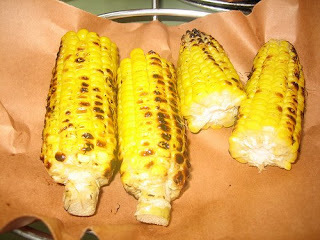 We of course had to try the grilled corn. It was sweet and there were a few soft spots in the corn...but for the most part it was sweet and crisp which is how I like my corn. 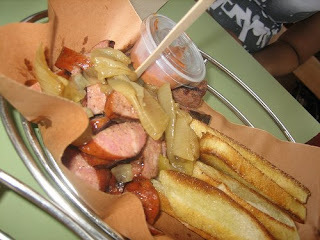 The above is SoHo Park's: Hungarian Spiced Kielbasa which was served with spicy mustard and another dipping sauce. 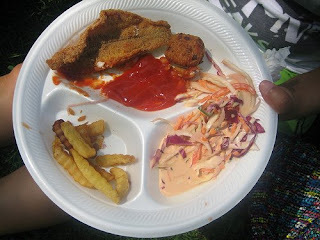 I can't tell you enough how delicious this plate was. I highly suggest you order this when you visit. By far the best dish of the day. 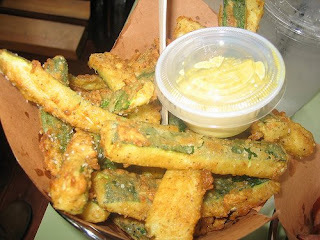 I wasn't sure what to expect from the Chicago Fried Zucchini Sticks. I thought they were o.k. but Pinky and me thought they were a bit heavy. I don't know, maybe they lacked salt or something but they were just missing. 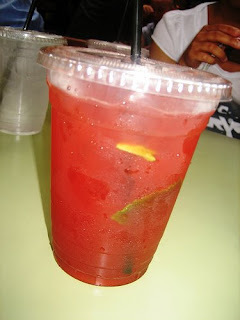 The above are SoHo Park Iced Tea. The breakdown is fresh brewed loose ceylon tea, berry puree, and mint. I really liked this drink and it is hard to pick a winner between this and the Southern Sweet tea that we had at the Mississippi Fest...I'm not going to pick a winner just in case, E checks this blog. Oh, that is Pinky in the background there. I think she was also taking her own pictures.